Release notes for the February 2018 "Woodchipper" update to Qmora. We are excited to announce the launch of our latest release, codenamed Woodchipper in honor of Salsa Cycles break through drop bar handlebar design. 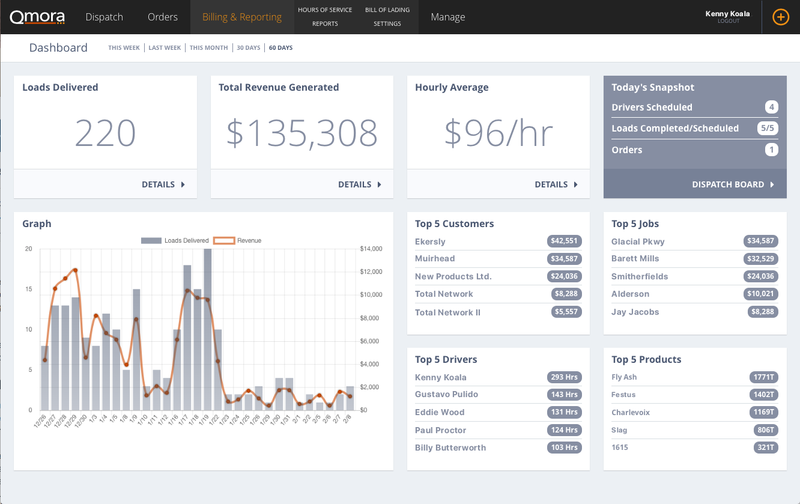 Much like the Woodchipper defines the dashboard of a bike, this release provides a dashboard for your business. This is our first step into this area, and have plenty more coming, so stay tuned. Woodchipper's hallmark feature is the addition of a fully-featured Dashboard. Available with a single click to the 'Billing' menu, or by clicking on the Qmora logo, the new dashboard gives you an instant snapshot of the current status of your company. The dashboard can report 'This Week', 'Last Week', 'This Month', the last 30- and 60-days. Across the top you'll find the total loads delivered, revenue generated, and your hourly average. Finally across the top is a snapshot for today, you can see your scheduled drivers, the status of your loads, and how many orders you have. Below the top bar, we calculate your top 5's for Customers, Jobs, Drivers, and Products. Finally, we added a slick graph that compares your loads delivered per day to the revenue generated per day. We added a toggle to the Billing of Lading entry page that allows you to see only the loads that are incomplete, allowing your office staff the ability to locate the loads that need information. Fixed a bug that prevented your from Archiving Jobs in a few rare instances. Fixed a bug where the Surcharge Schedule rate would use the current schedule and not the schedule applied to the load.